If you’re looking for an activity with a difference for your weekend on Tenerife our special Cable Car family excursion may well give you the excuse you were looking for to go up Mount Teide, on a trip you can all enjoy together. On the special Cable Car package for families, you can enjoy a guided visit to the Pico Viejo viewpoint. Equipped with an earpiece so that you can hear the guide’s explanations, and a map of the footpaths around the peak of Mount Teide, you and your family can spend an informative and fun day on Mount Teide. Along with other families, you will discover the flora, fauna and geology of the National Park while you follow the spectacular footpath to the Pico Viejo viewpoint. Did you know that at the end of the path to the Pico Viejo viewpoint, you will find impressive views of La Gomera, el Hierro and La Palma, as well as the awe-inspiring 800-metre-diameter crater of Pico Viejo - which was at one time filled with a lake of lava? The package for your guided visit to the Pico Viejo viewpoint includes return Cable Car tickets for all the family. 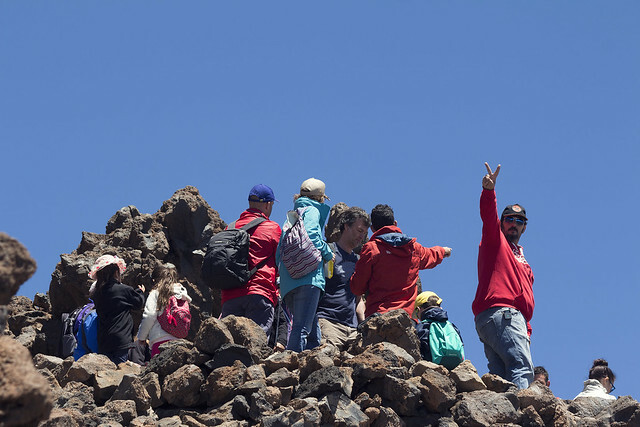 Make a date for the whole family to enjoy the wonders of Mount Teide! The meeting time is set depending on the day. You can check it when booking for a specific day. It will also figure on the booking voucher which you will receive to produce upon your arrival. Families must be prepared for the possibility of extreme heat or extreme cold depending on the time of year when their special guided family visit to the Pico Viejo viewpoint takes place. Wear warm clothing and proper footwear. Due to the elevated luminosity, wear sunglasses. Take plenty of water on hikes. Teide Cable Car is located within a protected national park and therefore it is necessary to follow a series of basic rules of civic behaviour, respectful of the natural environment, such as not littering or taking rocks, plants or animals. It is prohibited to make fire, loud noises or to camp. People with heart problems and pregnant women are not allowed to ascend due to the risk that high altitude poses to their health. Families are advised to consult their doctor before planning their visit if any member of the family has a health condition. The facilities at Teide Cable Car are not adapted to those with physical disabilities. 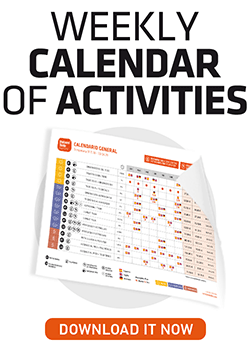 Children under 5 are not allowed to participate in this activity. It is absolutely necessary to produce the booking confirmation, either printed or displayed on a mobile device. In the event that the cable car has to close on the day of the Mount Teide for families excursion due to reasons beyond our control, adverse weather conditions or failure of the cable car facilities, an alternative excursion will be arranged for the families and there will be no refund of the amount paid for the excursion. Los Roques is an alignment of ditches, pitons and piles of various volcanic materials; it constitutes the division between the two semicalderas into which the vast caldera of Las Cañadas is divided. The route runs around Los Roques on its first stretch through the northeastern caldera, and then descends into the southwestern one. Reservations may be cancelled or the date may be changed free of charge until 3pm on the day prior to the activity. Same day or later changes/cancellations incur a charge of €6 per person. Date changes are valid for 1 year provided that the vouchers have not been redeemed. Any change of date or cancellation must be made within a period of no more than 30 days from the date of the initial booking. Up to 3 date changes are permitted. The Teide Cable Car base station has a free car park with 220 parking spaces, which is open from 8am to 6pm. The base station’s facilities include an information centre and a shop. There are public toilets at the Teide Cable Car’s base station. In case of discount tickets for children or local residents, a supporting document is required to prove entitlement to discount. Meet your guide at the Teide Cable Car base station. Teide Cable Car is well connected by roads, and can be easily reached from any point of the island. Take the TF-23 motorway from Boca de Tauce to Chío, which connects with TF-21. Titsa bus, Route 348 Puerto de La Cruz – Las Cañadas del Teide. Departure times: 9.15am from Puerto de la Cruz, with stops in La Orotava, Montaña Blanca (trail to the Altavista Mountain Refuge) and Teide Cable Car, and return from the Teide Cable Car departing at 4.00pm. Take the TF-21 motorway from Vilaflor to Teide National Park, the route of access for the tourist areas of Playa de Américas and Los Cristianos. Titsa bus (guagua), Route 342 Playa de Las Américas - Las Cañadas del Teide. Departure times: 9.15am from Las Américas, with stops in Los Cristianos (9.30am), Teide Cable Car and Montaña Blanca (ascent on foot to the Altavista Refuge). Return from the Teide Cable Car departing at 3.30pm. Take the TF-24 motorway from La Laguna to Portillo de la Villa (La Esperanza Motorway), which connects with TF-21 that will take you to the Teide cable car base station at km 43. Mt. Teide is approximately an hour’s drive from any point on the island.